You should not have to find a different law firm every time you have a legal need. You should have one trusted firm you can rely upon for all of your needs, where you are known by name and that can provide the quality legal representation you require. 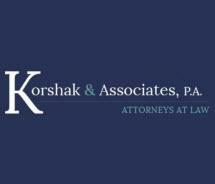 At Korshak & Associates, P.A., we strive to be that firm for each of our valued clients. With more than 40 years of combined experience, our attorneys offer knowledgeable representation across a wide range of legal matters, including family law, wills and probate, civil litigation, business litigation, real estate litigation, contracts, collections, and personal injury law. Our diverse clientele consists of individuals, business owners, professionals, landlords, real property owners, real estate investors, homeowners associations and many others. If you have a legal problem, we encourage you to contact us to learn more about our legal services. In the unlikely event that we are unable to provide representation for your legal matter, we will do our best to point you in the direction of someone who can provide the assistance you require. If you are involved in a legal matter that will have a strong impact on your family, your business or your financial security, the attorney you choose is important. As a client of Korshak & Associates, you will have a strong advocate on your side. We understand that the work we do often has a profound impact on the lives of our clients. When we choose to take a case, we do so with an understanding of what is at stake and with a deep sense of commitment to the client we serve. We are proud to provide the quality legal representation that is often found only at large downtown firms, while still providing the affordability and superior client service that are the hallmarks of a small firm.